Beveled Solid Walnut Plaques feature a 1/4" bevel and smooth classic feel. Available in six sizes. Bevel Walnut Plaques and a compete line of quality plaques, perfect for corporate, school and sports awards. Our Beveled Circle acrylic award is a simple yet beautiful design which exemplifies it's versatility as an award and commemorative achievement. It provides plenty of room for custom laser engraving, color printing or both! Available in four sizes and your choice of blue, red, green, gold or purple reflective bottoms! Stunning angles on this accented clear acrylic award allow for different light reflections to create a excellent employee service award, salesperson award or any other acrylic award presentation. 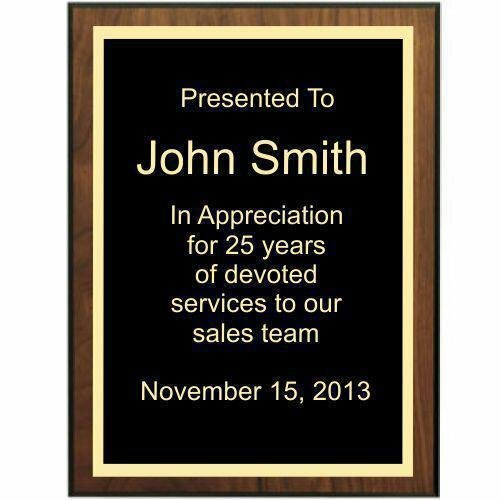 Available in three sizes and 1 1/4" thick, this is a winner of an acrylic award. Image shown with full color imprinting, available as an optional imprinting method to this acrylic award. The Beveled Clipped Corner acrylic award is a classic favorite. It is crafted from the finest acrylic and polished by hand to perfection! It features beautifully clipped corners and bevels, perfect for reflecting your choice of blue, red, green, gold or purple reflective bottoms. Available in two sizes! Pure K9 premium optic crystal cube with clipped corner so it can sit at an angle. A beautiful paper weight that can be a great talking piece in the office. Available in three sizes 2", 2 3/8" and 3" respectively. These beautiful beveled cube acrylic awards are designed with cut corners that allow them to stand on end for an awesome effect! Available in your choice of blue, red, green, gold or purple reflective bottoms. The Beveled Flame acrylic award will definitely have attention! It's hand cut from extra thick 2" high quality acrylic and features a beveled face. Available in your choice of blue, red, green, gold or purple reflective bottom! Phone: 661-323-4015 Fax: 661-324-6183 Powered by BizWizard ShopKart by NetSoft Studio, LLC.